Take your sundaes and cones to the next level with irresistible toppings including hot fudge, sprinkles, strawberry syrup, and chopped nuts. Ice cream cones offer a delicious and convenient way for guests to transport and enjoy their favorite flavor of ice cream or frozen yogurt. Skip the hassle without sacrificing flavor by keeping your bakery, cafe, or concession stand stocked with this soft serve ice cream mix. These supplies include everything you need to create fresh, crisp waffle cones perfect for complementing your signature sweet treats. 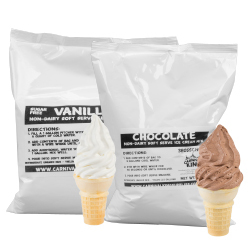 If you want to stock up on soft serve making supplies, we offer soft serve mixes that you can add directly to your machine. Our variety of colorful toppings and cones also give your guests many flavor options while attracting customers' attention. Store your homemade ice creams in our display and storage containers so guests can easily see your flavor options. Our soft serve machines will help you make your sweet treats. Serve up scoops of freshly made ice cream with our ice cream spades and our dessert glasses! If you're wondering where to buy ice cream and soft serve making supplies, we have a large selection of ice cream and soft serve making supplies for sale at the lowest prices. The cool, creamy sweetness of ice cream combined with the crispy crunch of an ice cream cone makes for the perfect summer treat. Cones enhance the taste and texture of your ice cream treats, so they are just as essential as the ice cream itself! 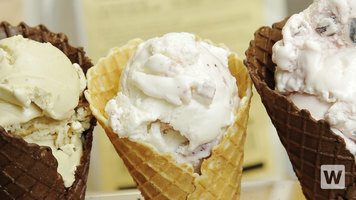 Varieties like waffle cones and sugar cones add new flavors and textures to each ice cream serving. With different types of ice cream cones at your shop, you can increase your overall profits and find new ways to serve your most popular ice cream flavors! But how do you know which cones are the best for your busy concession stand or your ice cream parlor? This guide will help you decipher the different variations, features, and uses for each cone type! Learn how to make your own waffle cones with this easy step-by-step guide! 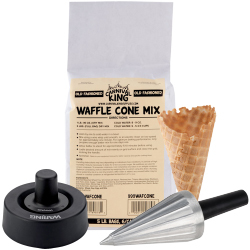 Also, check out our waffle cone makers for a simple way to create delicious cones! We offer a wide variety of ice cream and soft serve making supplies including ice cream mixes, syrups, cones, and toppings. If you need to stock up on cones we offer waffle cones, chocolate dipped cones, and gluten free options. 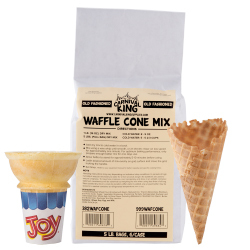 Reduce the chance of breaking prepackaged cones by using a waffle cone mix and roller to make homemade cones. 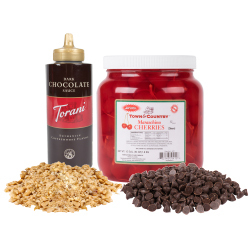 From sprinkles to crushed candies, our ice cream making supplies are sure to add a boost of flavor to your dishes and attract customers' attention, too. We have brightly colored jimmies that are perfect for holidays or parties, and our hot fudge and syrups add extra richness to your ice cream. We also carry holders for storing your frozen treats, making it easy to display and serve desserts to customers.